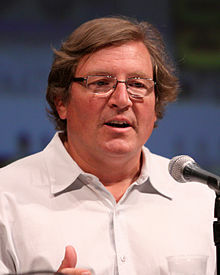 Lorenzo di Bonaventura (Italian pronunciation: [loˈrɛntso di ˌbɔnavenˈtuːra]; born January 13, 1957) is an American film producer and founder of his company Di Bonaventura Pictures. He is known for producing the Transformers film series. Di Bonaventura spent the 1990s as an executive at Warner Bros. Pictures, eventually rising to president of worldwide production. His production company Di Bonaventura Pictures is based at Paramount Pictures. His tenure at Warner Bros. included discovering and shepherding The Matrix into production, and the purchase of the rights to the Harry Potter books by J. K. Rowling. Di Bonaventura has purchased the film rights to the six-part series of fantasy novels The Secrets of the Immortal Nicholas Flamel by Michael Scott. Di Bonaventura said that Scott's "fantastic series is a natural evolution from 'Harry Potter'." In the documentary Side by Side, he criticized the ubiquitousness of inexpensive high quality cameras for essentially allowing anyone to become a filmmaker, potentially saturating the media landscape with awful entertainment that the masses wouldn't be able to distinguish from works by conventionally trained persons. This new media landscape is flawed due to lack of a "tastemaker"—similar to how Steve Jobs complained that journalistic editorial content was now sorely lacking, mentioned at one of the Some Things Digital conferences. Di Bonaventura graduated from Choate Rosemary Hall and Harvard University. He later received an MBA from the University of Pennsylvania's Wharton School. His father, Mario di Bonaventura, was a symphony conductor, and his uncle, Anthony di Bonaventura, was a concert pianist. Di Bonaventura serves as chair of the Creative Council for Represent.Us, a nonpartisan anti-corruption organization. He has served on the Claremont Graduate University Board of Trustees since 2015. ^ "LORENZO DI BONAVENTURA TO RECEIVE CAREER ACHIEVEMENT AWARD". www.zff.com. Zurich Film Festival. August 23, 2016. Retrieved August 15, 2017. ^ Moon, Transformers At The. "Lorenzo di Bonaventura - June 2007 - Transformers At The Moon - www.transformertoys.co.uk". ^ Weinstein, Joshua L. (11 October 2010). "Di Bonaventura on a bonny venture". Variety. ^ "Mario di Bonaventura (Composer) - Short Biography". www.bach-cantatas.com. Bach Cantatas Website. Retrieved August 15, 2017. ^ "About | Represent.Us". End corruption. Defend the Republic. Retrieved 2016-11-01. ^ "Lorenzo di Bonaventura ·". www.cgu.edu. ^ "Constantine". Rotten Tomatoes. Flixter. Retrieved 31 January 2011. ^ "Shooter". Rotten Tomatoes. Flixter. Retrieved 22 October 2014. ^ "1408 – Rotten Tomatoes". Rotten Tomatoes. Archived from the original on 1 November 2007. Retrieved 3 November 2007. ^ "Transformers". Rotten Tomatoes. Retrieved 5 August 2012. ^ "Stardust". Rotten Tomatoes. Flixster. Retrieved 17 March 2008. ^ "Imagine That Movie Reviews, Pictures". Rotten Tomatoes. IGN Entertainment. 14 June 2009. Retrieved 19 June 2009. ^ "Transformers: Revenge of the Fallen". Rotten Tomatoes. Retrieved 30 April 2012. ^ "G.I. Joe: The Rise of Cobra". Rotten Tomatoes. Retrieved 8 February 2014. ^ "Dark of the Moon (2011)". Rotten Tomatoes. June 28, 2011. Retrieved October 21, 2012. ^ "The Devil Inside". Rotten Tomatoes. Retrieved January 6, 2012. ^ "Man on a Ledge". ^ "The Last Stand (2013)". Rotten Tomatoes. Retrieved December 28, 2014. ^ "G.I. Joe: Retaliation". Box Office Mojo. Retrieved January 30, 2018. ^ "G.I. Joe: Retaliation". Rotten Tomatoes. Retrieved January 30, 2018. ^ "Jack Ryan: Shadow Recruit (2013)". Rotten Tomatoes (Flixster). Retrieved February 10, 2014. ^ "Transformers: Age of Extinction". Rotten Tomatoes/Flixster. Retrieved 2015-06-15. ^ "Deepwater Horizon (2016)". Rotten Tomatoes (Flixster). Retrieved January 29, 2017. ^ "Pet Semetary (2019)". Rotten Tomatoes. Fandango. Retrieved April 2, 2019. ^ LaPorte, Nicole (February 27, 2007). "Paramount gets tough with Santa myth". Variety. Retrieved August 19, 2016.